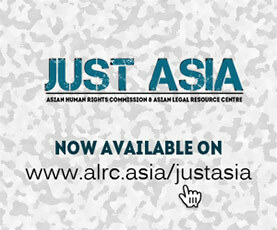 (Hong Kong, July 9, 2007) A new publication by the Asian Legal Resource Centre (ALRC) documents the “serious threat” facing constitutionalism in Thailand under the September 19 coup group. The 68-page special edition of the bimonthly periodical article 2 describes the future of constitutional rule there as being in serious jeopardy as a consequence of the latest military takeover. “This is a very important document at a critical time for the future of constitutional rule, justice and human rights in Thailand,” Basil Fernando, the Hong Kong-based regional rights group’s executive director, said on release of the new edition. “As a result of last year’s military coup and the subsequent actions of its leadership, it is now on the verge of a return to very primitive forms of institutional behaviour and social control,” he said. “It is essential that people both in Thailand and abroad engage in open and frank debate about the way in which the country is headed and what can be done to stop or at least mitigate its extremely adverse consequences,” Fernando added. In the leading article Fernando likens the destruction of legal systems to the draining and polluting of the Dead Sea. “Where a legal system constantly suffers interruptions in flow due to military coups, suspending and alteration of constitutions, and reductions of civil liberties by emergency decrees and state security laws then that legal system also may be reduced to nothing more than a polluted pool instead of a vibrant, living sea,” Fernando writes. “As with the ecological system, the consequences of a destroyed legal system are felt in all areas of life, not only within the legal system itself,” he adds. The edition contains a feature on cases taken up and decided by courts in Thailand in accordance with the rights outlined under the abrogated 1997 Constitution, including a number relating to protection of the environment, as well as cases invoking rights of the disabled and freedom of expression, and those involving persons fighting against abuse of authority by government officials. It also contains a number of other articles on constitutionalism and human rights, including one by Thanet Aphornsuvan of Thammasat University in Bangkok, written prior to the coup. The special edition can be downloaded in PDF format at, www.article2.org/pdf/v06n03.pdf, or in HTML format from the article 2 homepage, www.article2.org. Printed copies can be obtained by writing to the editor, article 2, at the ALRC.